"I will be merciful to their own righteousness, and their sins and their iniquities will I remember no more" (Hebrew 8:12). Scrapbooks usually contain no tokens of bad memories; we save only good mementos. 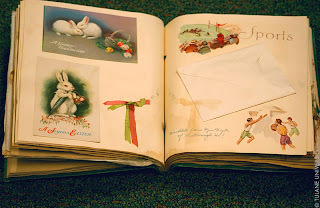 In a thick book with sturdy, blank pages, we collect a lifetime of pleasant keepsakes. Later we’ll drag out the old scrapbook and delightfully relive our good times through its pages. Sometimes, however, when we mentally review our life, we dwell on regret and self-reproach. In our mind we’ve filled volumes with past sins. Beyond yellowing photos and newspaper clippings in a tattered scrapbook, our mind’s eye recalls the ugly grievances we try in vain to forget: rebellion, disobedience, and bargaining we slung in God's face and our lack of praise, thanksgiving, and faithfulness toward him. If we have repented and been forgiven for these and other sins, we create guilt when we choose to remember them. God says when He forgives us for sinning, He also forgets our sin (Hebrew 8:12; 10:17). He separates us from our sin as far as the east is from the west (Psalm 103:12). Why can't we be as kind toward ourselves? We build scrapbooks like God treats sin: we keep only good memories. With God's help we can live in the same manner. We can release our forgiven sins and forget them. God has. The winner of last Thursday's blog post for a copy of Waiting for Spring by Amanda Cabot is Abbi. I'll email you to get your mailing address and get the book out to you. Thanks all for commenting. Watch for more book giveaways. Susan, thank you. I'm glad you came by and enjoyed the post today. Thanks for reading my blog. Kay, thanks for reading my blog. I'm happy that you received inspiration from this post. When I changed my Monday blogs to be devotionals I wondered if I would have any traffic. Susan's comment above and yours encourage me.